The main dance floor, filled with beats from the world’s best DJs, is home to 100 square feet of interactive projection screens on a performance structure where impromptu surprise acts by world-renowned artists will take place. 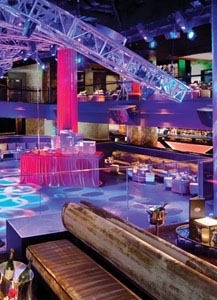 Suede walls and plush surfaces speckle the weaving interior of this nightlife destination boasting a unique 70-foot wall of lights that incorporates the latest in technology. Haze’s revolutionizing sound system, designed by Avalon Sound, is the first audio system in the world to utilize the latest in sound technology that will create a music environment unlike anything Las Vegas has seen. Full color laser shows add to the sensory experience, creating a nightlife mecca that will raise the standards of nightclubs around the world. about 10:30 p.m. – 4 a.m.